A client in the BURP_DIV domain tries to access services on a DISENTRY server. The server requests authentication services from a DISENTRY Domain Controller. 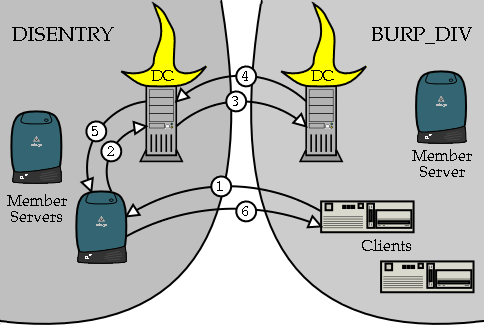 The DISENTRY Domain Controller trusts the BURP_DIV domain, so it requests authentication services from a BURP_DIV Domain Controller. ...which replies to the client.